Make breakfast for dinner an extra special treat. I’m a fan of eggs- for breakfast, lunch, and dinner. Most often you’ll see me creating some dish or another with egg whites, but sometimes I just need more sustenance than that. A nice, easy go-to is a simple omelet with some veggies, maybe some protein, and cheese. However, for not much more effort, an excellent choice is a shakshuka. This recipe is just one version, and a vegetarian one at that. Rereading the recipe, I discovered that this recipe was created in my pre-runny yolks days. Now, when I make this dish, I go for the whole egg. 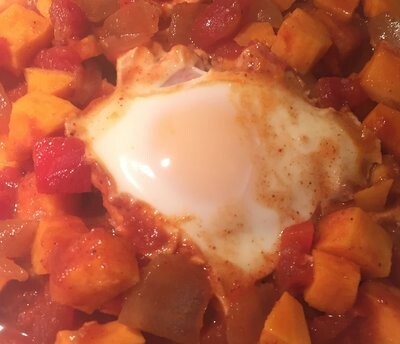 Forget simple poached eggs, give this easy and exciting dish a try. To learn more about this recipe, originally published in Febuary 2016, keep reading. I have been seeing pictures and recipes of shakshuka for quite some time. It looked like an interesting dish, but for one reason or another I delayed giving it a try. However, with this week’s recipe theme being one-dish meals, shakshuka was on my list of recipes to master. Plus with my husband trying to eat more healthfully, I have been making Tapas Monday dishes that are less slurge-y but still tasty. The combination of those two factors made for the perfect time to try shakshuka. The only thing I knew about shakshuka was that it is tomato-based and is finished with eggs poached in the liquid. As I did a little research on this Tunisian-based dish, I discovered there could be a number of ways to change it to meet our needs. Many people use plain potatoes to make it a heartier dish. I used sweet potatoes to add more vitamins and flavor. Also, I am not a fan of yolks, especially those that are runny, so for my servings I added only the egg white. As for seasonings, the traditional dish usually has paprika and hot peppers; however, you can adjust the seasonings to your liking. Served with lavash or crusty bread to help you clean your bowl thoroughly, it makes for a healthy, light dinner. Coat an 8-inch baking dish with nonstick cooking spray. Add tomatoes, potato, onion, garlic, paprika, chili powder, cumin, and flakes to dish. Stir to combine. Make 4 wells in the corners of the pan. Break one egg into each well. Return to oven, uncovered, and bake for 10 minutes or until eggs are set.